Houghton Harriers celebrate 70th anniversary year with fine performances by their youngsters. Houghton Harriers have been celebrating their 70th anniversary year with a series of fine performances during the summer by their young middle distance runners. The group, coached by former international marathon runner Lynn Cooper, is growing from strength to strength. Thanks to the link with Houghton Kepier School they have a steady supply of youngsters coming forward to join their ranks. And two of them, Henry Johnson and Will Bellamy, both 15, have been shining in competitions up and down the country. At the North East Grand Prix, Johnson won the Stan Long mile, beating all senior athletes to win in 4.17.00. During the summer he won the County Schools’ 1500m title and finished sixth in the English Schools (4.05.57). He has an impressive list of personal bests including 51.5 for 400m and 1.54.8 for 800m. Bellamy finished fourth in the English Schools 3000m in a personal best of 8.47.42. He won the Northern Athletics Under-17 1500m (4.03.62) two weeks ago and also enjoyed success in winning the Northern Athletics Inter Counties 1500m (4.03.62). His PBs includes 800m (1.55.95), 1500m (3.56.96) and 3000m (8.47.42). He will be contesting the England Athletics championships at Bedford over the Bank Holiday weekend. The club’s youngsters also enjoyed success in the North East Track and Field Championships at Middlesbrough’s Sports Village in May. Henry Johnson took the silver medal in the Under-17 1500m (4.11.6) and won a bronze in the 800m (2.01.40), Will Bellamy finished third in the Under-17 1500m (4.13.9) and Sam Gibson was third in the Under-17 3000m (9.15.17). Cooper, who coaches her charges five days a week at various venues including the tracks at Silksworth, Monkton and Chester-le-Street plus Hetton Lyons Country Park and Herrington Country Park, said: “We are one big happy family. “All our young athletes and senior athletes train together which leads to great camaraderie among the group. After training on Saturday Cooper was off to Manchester for the British Milers’ club Grand Prix at Stretford where one of her charges, Lee Dover, was competing in the senior men’s 5000m. She added: “It was well worth the trip as Lee knocked one second off his previous best.” It now stands at 15.56.16. It was in 1958 that Houghton got off the ground when Jim Lauderdale and the Bernard Gilpin School headmaster Jack Forrester decided to form the club. Shortly afterwards, through the influence of Forrester, a leading member of the English Schools’ management committee, a 440 yards track was laid in the school grounds. It hosted the English Schools’ Championships in 1958 and the International Schools’ Home Championships in 1964. Sadly, the track is no longer in use. Then at the first International at the Gateshead Stadium, Watson led a Houghton one-two-three in the youths 220 yards, winning in 22.5 with John Cocking second and Martin Hall third. On the cross country front Houghton were awarded the Northern Cross Country Championships and in 1965 they had their first champion when Lavina Petrie won the women’s title at Oldham. She moved to Australia and last year she won the World Masters’ best performance of the year award for her endurance performances. Ernie Pomfret, a Seaham policeman, became the club’s first and only Olympian, making the 3,000m steeplechase final at Tokyo in 1964. Haswell-born Pomfret was advised to join the Harriers in 1958 after winning a race in the pit sports. His international career spanned from 1961-67, representing his country on over 60 occasions, including the British Empire Games and the European Championships. His 18-year-old grandson, Joe, is a member of Sunderland Harriers. 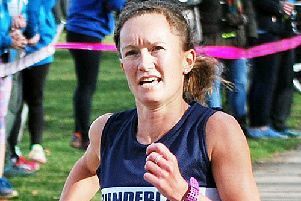 Before concentrating on coaching, Cooper, formerly Harding, represented Scotland twice in the Commonwealth Games, finishing 11th in Auckland in 1990 and 12th in Vancouver four years later. She held the Scottish marathon record from London in 1989 with 2.31.45 before Liz McColgan broke it. Carolyn Naisby was another club athlete who made her mark on the international marathon scene, winning the 1987 Florence Marathon in 2.33.22.